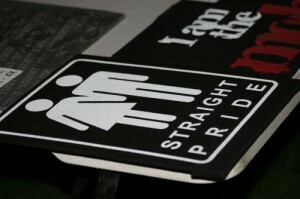 ‘Straight Pride’ or Promoting Bigotry? Students from at least three rural, mid-Michigan high schools participated in an event they dubbed “straight pride day” last Friday. And while the events were without disruptive incident, they were not without controversy or concern. Students, parents and school officials spoke to Michigan Messenger about the event in the days leading up to it. Treyton Gregg, a 17-year-old junior at Laingsburg High School where the event was evidently centered, said he was worried about the event, particularly in light of how some of his peers responded to the estimated 50 student who participated in the Day of Silence event the previous week, an annual event when students protest anti-gay bigotry by staying silent for the day. Read FULL STORY from Todd Heywood at The Michigan Messenger.